1. 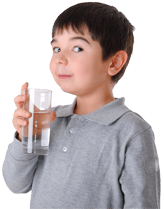 Even though the daily recommended amount of water for an adult to drink per day is eight cups, not all of this water must be consumed in the liquid form. Nearly every food or drink item provides some water to the body. 2. Soft drinks, coffee, and tea, while made up almost entirely of water, also contain caffeine. Caffeine can act as a mild diuretic, preventing water from traveling to necessary locations in the body. 3.By the time a person feels thirsty, his or her body has lost over 1 percent of its total water amount. 4.Water leads to increased energy levels. The most common cause of daytime fatigue is actually mild dehydration. 5. Pure water (solely hydrogen and oxygen atoms) has a neutral pH of 7, which is neither acidic nor basic. 6. Somewhere between 70 and 75 percent of the earth’s surface is covered with water. 7. The earth is a closed system, meaning it rarely loses or gains extra matter. The same water that existed on the earth millions of years ago is still present today. 8. The average person in the United States uses anywhere from 80-100 gallons of water per day. Flushing the toilet actually takes up the largest amount of this water. 9. The United States uses about 346,000 million gallons of fresh water every day. 10. The United States uses nearly 80 percent of its water for irrigation and thermoelectric power.